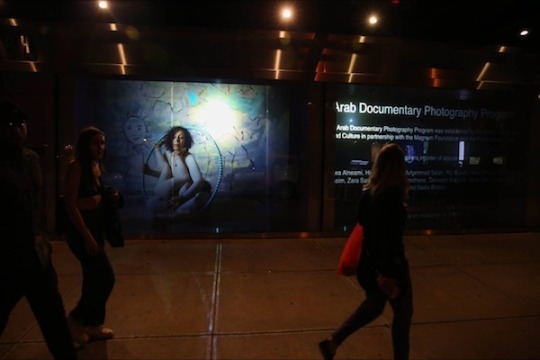 A selection of images from the Arab Documentary Photography Program are projected onto ICP’s public facing windows in the evenings through August 6. 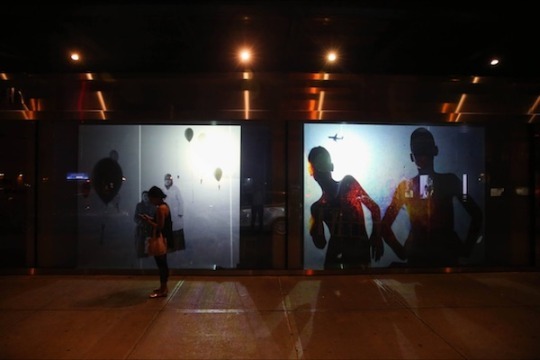 The projections can be viewed from the street at 250 Bowery, New York, NY. This exhibition is part of ICP’s new ongoing series Projected. The Arab Documentary Photography Program is a joint initiative between Magnum Foundation, the Arab Fund for Arts and Culture, and the Prince Claus Fund to support and amplify creative approaches to visual storytelling that challenge conventional narratives about the Arab region. The program values a range of creative approaches, from classical reportage to more conceptual frameworks, using the term documentary to ground projects in contemporary critical issues. Grantees are selected each year through an open call for applications and receive production support for long-term creative projects within a six-month individual mentorship program with Randa Shaath, Eric Gottesman, Tanya Habjouqa, and Peter van Agtmael. Over the course of their project development, grantees come together for two intensive workshops in Beirut, where they have the opportunity to connect in-person with their mentors and with program advisors Bertan Selim, Susan Meiselas, and Emma Raynes. In its fourth year, the Arab Documentary Photography Program has supported projects by 36 photographers from 15 countries, which have been published and exhibited both regionally and internationally. A vibrant community is growing from this program, one that continues to be a safe place for experimentation and connectivity long after projects are completed. • Arwa Alneami, Saudi Arabia. “Never Never Land” is a look into how women experience Saudi theme parks, where there exist stark dichotomies between fun and gender-specific restrictions. • Tasneem Alsultan, Saudi Arabia. “Saudi Tales of Love” goes beyond the surface of elaborate wedding ceremonies to explore the complexities of marriage, following the stories of young brides, widows, and divorcées, as well as women that are happily married. • Mostafa Bassim, Egypt. “Revolution of the Mind” shows the influence of state control on Egyptian society by telling the stories of seven progressive young men who have been victims of civilian-led smear campaigns, community surveillance, and random acts of violence. • Zied Ben Romdhane, Tunisia. “West of Life” illustrates the landscapes and day-to-day in a phosphate mining region in the southwest of Tunisia, a place rich in resources but disenfranchised by the government. • Nadia Bseiso, Jordan. “Infertile Crescent” follows the route of a controversial 180 km water pipeline being built between Jordan, Palestine, and Israel, documenting the historic, environmental, and domestic sites that lay in its path. • Sima Diab, Egypt. “She as He” follows the story of Nadia, who dresses as a boy to enjoy the freedom in public afforded to men in Egypt. • Hicham Gardaf, Morocco. “Intersections” explores the ways in which Morocco’s identity is being redefined through the modernizing landscape, observing where pristine land meets urban space and tradition meets the future. • Omar Imam, Lebanon. Through collaborative portraits, “Live Love Refugee” explores the struggle of the internal landscape for Syrian refugees who have lost their native ones, the constant uncertainty of exile, the memories that we carry with us, and the hopes that keep us alive. • Heba Khalifa, Egypt. “Homemade” portrays the anxieties, challenges, and pressures of being a women in Egypt through collaborative and environmental mixed media portraits. • Roï Saade, Lebanon. “The Epic of Dalieh” highlights one of Beirut’s last natural outcrops, where the public can freely access the coastline, and its imminent closure as the land is given over to developers with plans for a private resort. • Muhammad Salah, Sudan. “I Want to be Visible” is a personal exploration of skin color and identity, framed by Sudan’s colonial history and mainstream usage of skin lightening products. • Zara Samiry, Morocco. “Tales of Moroccan Amazons” looks at the traditional equestrian shows that celebrate the historic military art of Berber-Arabs through the emerging participation of female horseback riders who are both challenging the patriarchal tradition and preserving an equestrian art form that is quickly vanishing.